Bethany Beach Vacation Rental – Bethany Bay, 116 Anderson Dr | Ocean View Bethany Beach Rentals. Bethany Bay is a beautiful resort community located along the shore of the Indian River Bay where you'll find the luxury of a "get- away- from- it- all" retreat and "close to everything" convenience. 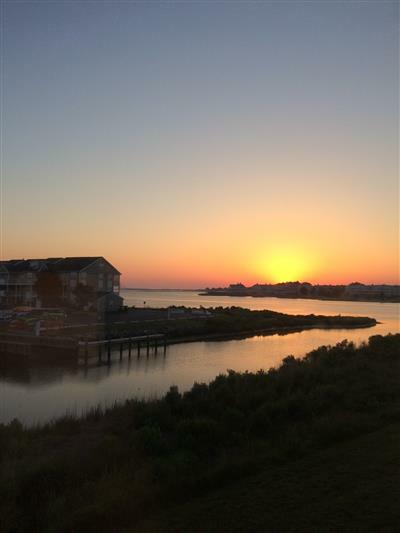 Only a few miles from Bethany Beach this beautifully decorated second floor unit offers 2 bedrooms with 2 full baths and is nestled within unspoiled land and gently lapping inland waterways ---just the perfect place to relax, refresh and re-energize! Some amenities include central air conditioning, full kitchen has dishwasher, microwave, washer/dryer, 3 Flat Screen TVs--1 is 55" , DVD, WiFi, screened porch with a view of the bay, and deck. Gorgeous sunrise view from the master bedroom and porch. The community includes beautiful 9 hole par 3 golf course, pool and pool-side spa, tennis court and kiddie pool! Mini Weeks available! My parents, my husband, and I really loved this unit. We loved the view from the balcony everything else in the condo was lovely. We really enjoyed ourselves at the Bethany Bay and also the beach, my husband I have stayed in Ocean City but this is the first time in Bethany Beach, DE. We would definitely vacation here again.